In an innocuous bit of entertainment news that would probably be a lot more startling if it leapt, screaming at you, from out of a darkened corridor, the planned film adaptation of stunningly successful camera simulator Five Nights At Freddy’s has found its writer-director. Poltergeist and Monster House director Gil Kenan, no stranger to PG and PG-13 rated horror, has been hired to turn the game series’ string of phone calls, camera clicks, and leering, dead-eyed animatronics into a workable story. Kenan will write the film with video game scribe Tyler Burton Smith, telling the story of the world’s worst security guard gig, in which a hapless protagonist is forced to fend off murderous Chuck E. Cheese robots, lest they shove his mangled body into the waiting, whirring gears of an animatronic suit. 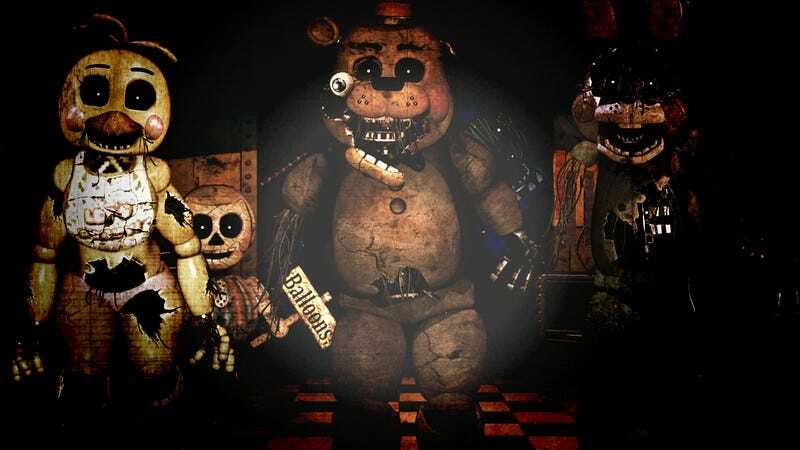 (Needless to say, the Five Nights At Freddy’s games are extraordinarily popular among young children.) The news about Five Nights comes not long after the announcement that It’s Always Sunny In Philadelphia’s Rob McElhenney would be directing the Minecraft movie, with the two films ready to launch The Great Recess Wars of 2016 or 2017 to a heightened, fevered frenzy that will leave no block un-smashed, no app un-downloaded, no teeth-and-scream-based scare un-jumped.